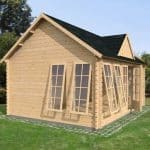 With this beautifully constructed and well sized log cabin you could imagine that you were in the Swiss alps, and yet it makes an ideal accompaniment for a British garden. 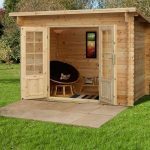 That’s because it creates an exciting new space that could be used for anything from a luxurious garden shed to an office that allows the owner to work from home. 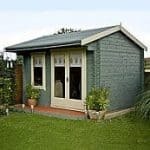 Thanks to its size it can also become a guest bedroom, and the overhanging roof creates a porch area as well that can be used for an al fresco dining area. 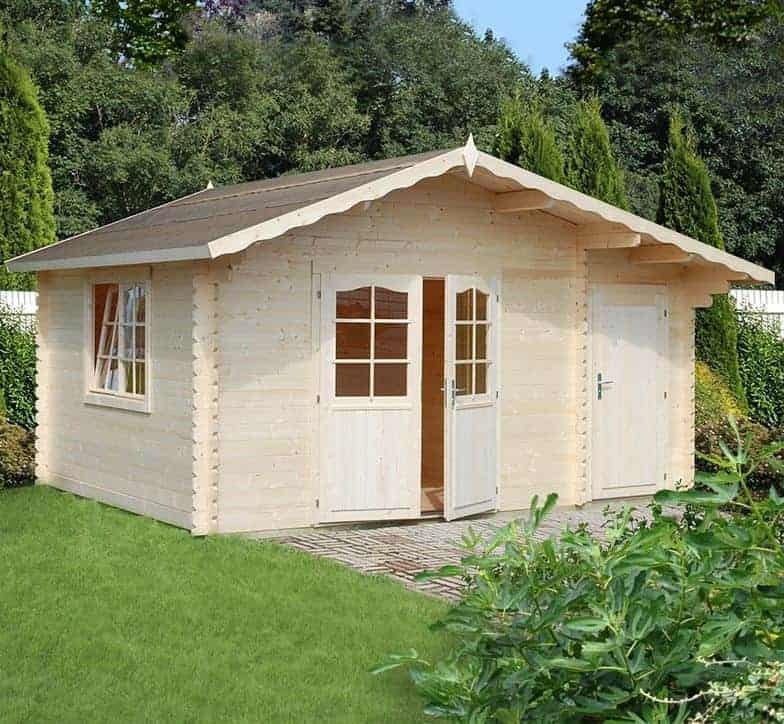 We feel that one of the most important factors when choosing a log cabin or workshop is security, and that’s why we were glad to see that both sets of doors have key operated locks. We say both sets, because as well as the main double doors, which were very wide, there’s a single door at the side of the front which opens onto a secure window free storage area. The log cladding itself is thicker than some that we see, and it’s very effective at stopping water penetration so the contents are kept dry as well as secure. The large and deep apex roof also helps to keep rainwater out by channelling it safely away. This large apex roofed log cabin has a lot of features that make it stand out from the norm, and yet we also liked its traditional chalet style look. It not only has an aesthetic appeal that will make it become a much talked about garden feature, it can also transform your property for the better. If you’ve ever wanted a guest bedroom, an extra dining area, a games room or even a home working office then this can be an affordable way to achieve it. The first thing that caught our eye was the roof itself, and not only because of the extra height it brings but because it has a large overhang that gives extra depth and provides a natural and shaded porch away. The ridge height it gives is a very generous 2.57m with an eaves height of 2.05m, and not including the overhang there’s an overall width of 4.50m and an overall depth of 3.30m. Thick cladding is essential for a building as large as this, and so we were pleased to find that 34mm interlocking logs were used on this cabin. We have seen thicker cladding used on some of the log cabins we’ve reviewed, but even so this is above the average and creates a strong and stable building once assembly is complete. We were also pleased to see that strength giving chalet connections are used, especially as these also give protection against wind. The floor is also perfectly adequate for everyday use, and its 19mm thick tongue and groove timbers, the same as those used for the roof where they are then given a mineral felt covering, means that it won’t need to be reinforced for all but the heaviest machinery and furniture. Whilst we are invariably impressed with the Palmako log cabins we review, we are also habitually disappointed to find, as on this occasion, that no preservative treatment at all has been applied by the manufacturer. This means that the customer has to apply high quality wood preserver immediately after assembly and also every year after that, and of course the bigger a building is the more onerous this task becomes. It also means that there is no warranty provided against wet rot, although there is a five year structural guarantee. There were two things we particularly liked about the double doors, and the first is that they are laminated. This not only helps them stand out from their surroundings, it also makes them very tough and water resistant. They are also very wide at 1.48m although their height of 1.64m is less than we usually see, so do be careful when entering and exiting the building. There’s also a single door to the side of the front, giving easy access to a storage area. The upper portion of the doors are glazed, but the main light source comes from a large double window on the side. Because the window can also be opened, it’s easy to ventilate the cabin if machinery is being used or on a hot day. We were pleased to see that this log cabin had a lot of useful security features, starting with a separate and window free storage area accessible by its own door. It also features key operated locks which are a very effective deterrent against break ins, even though we would have preferred to see double glazing used on the windows and on the glazed portions of the double doors. 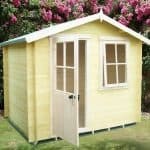 There is only one optional extra available for purchase with the shed, and at £726 for a professional assembly service we think that many people will elect to use the self assembly route. We do appreciate, however, that many people have very busy schedules, and so this could come in useful to those whose budget will stretch to it. 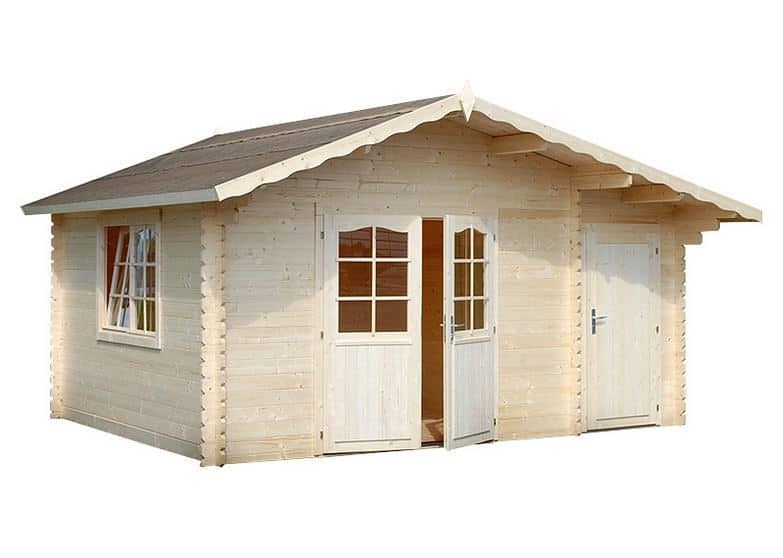 As the thick log and tongue and groove cladding and the use of chalet connections shows, there has been an emphasis places on high quality components throughout. Without an initial preservative treatment in place the substrate can be very vulnerable to moisture and rot, especially if the treatment schedule isn’t adhered to. This is one of the larger log cabins we’ve seen, especially if you take into account the extra covered area provided by the overhanging roof. Even though a professional assembly service is available, self assembly can be completed in as little as two hours with a friend’s help. At more than three thousand pounds, and with no initial protection against rot used, we feel that are other options that provide greater value for money. Final Thoughts: The owner of this log cabin will have to be prepared to put in a lot of work to keep the preservative treatment topped up, as well as providing an all important initial treatment. For people who aren’t daunted by this, however, then this is a very attractive and also very flexible garden building. 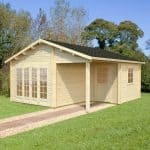 It’s not the cheapest log cabin we’ve reviewed, but it is still cheaper than a typical house extension and it also removes the worry of having to apply for planning permission as long as it’s kept the requisite distance from any fence or boundary. 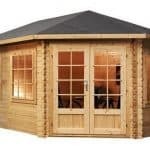 With a secure locking system and side storage area as well, it’s worth considering for people who will be storing items of value in a log cabin or workshop.